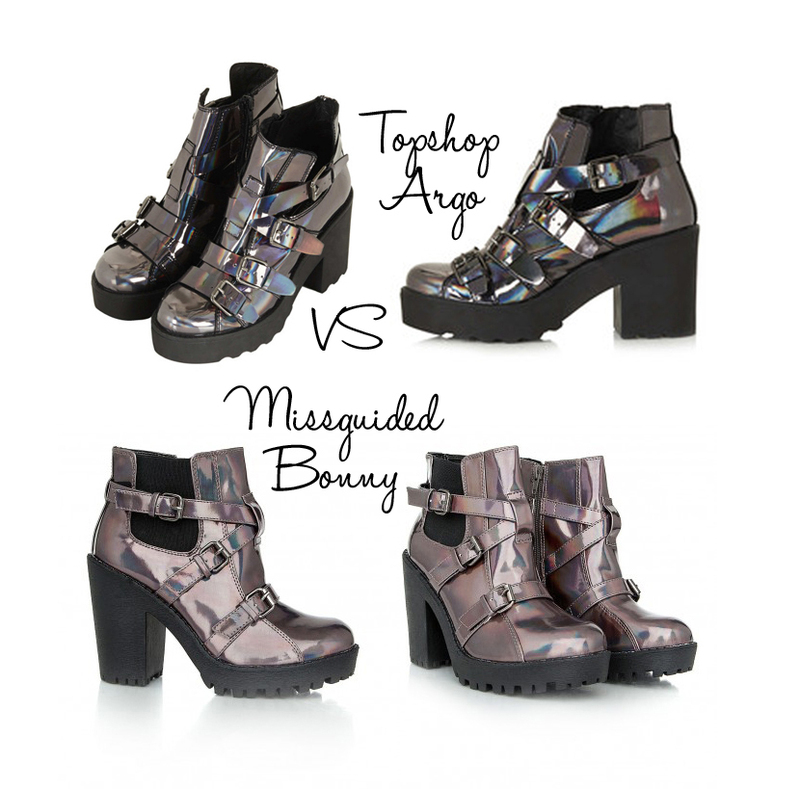 I have a big thing for chunky boots, and I also have a big thing for anything shiny and holographic, so when I saw the Argo boots on sale at Topshop in ‘Pewter’, which is a gorgeous dark holographic / metallic grey colour, I absolutely had to have them! At £92 though I was a bit put off by the crazy price point, but thought I might be able to get them for Christmas from my other half if I was very very good! 🙂 In the time between first seeing the boots and worrying that they might go out of stock, I saw a very similar pair on the Missguided site, called the Bonny, and they were only £39.99, so I thought I’d better buy them as a back up just in case! Verdict? Neither boots are made of leather – you’d probably expect the Argo to be at that price, I did! Both are made of very similar materials so the price is really the only difference here. Bonny wins this one. The Bonny boot has a slight pink tinge to the colour, and I’d say it’s a more metallic than holographic finish. The straps are also slightly thinner than the Argo. The Argo definitely has more of a holographic shine, if you catch it in the right light you can see a whole spectrum of colours that look amazing! Verdict? The Argo wins this one for me. If I’d only seen the Bonny boot I’d think it was amazing, but next to the Argo it’s definitely second place. I love the holographic finish and overall chunky look of the Argo. The Bonny I have in a size 5 and is on the snug side but does fit well, I’ve worn these for a day with only slight discomfort due to them being slightly on the small side.. The Argo boot on the other had, I have in a 6, this is because my feet are actually a 5.5 so it’s really hard to find the right size! I find Topshop shoes come up quite narrow so I went for the 6 and they fit well in width, but they are a smidge too long. I’ll live with it though as I do love the boots, and they are still very comfortable to wear. Verdict? I’d say this one is definitely a draw. My feet are an awkward size which doesn’t help, but both pairs of boots were very comfortable and I’ve worn both all day with no problems. Well this is actually very difficult!! It’s almost a draw, but even though the size isn’t perfect, and they’re more expensive, I still can’t help but love the Argo boot! The Bonny is a very worthwhile competitor and apart from the fact that I prefer the overall look of the Argo, I would definitely recommend the Bonny if you like this chunky style of boot, and don’t want to spend a small fortune! Are you a fan of chunky boots? I’d love to hear if you own a pair! The price difference is crazy! The Topshop ones definitely do look a bit nicer though. I’m obsessed with heeled chunky boots atm! I got a pair for Christmas and went out and bought another last week, sadly banned myself from buying anymore but these are gorgeous! Holy hell, the Topshop ones are stunning! Want! They really do look very similair! o my goodness they look amazing need a pair in my life ! Unbelievable price difference! I would go with the missguided pair definitely (only due to the smaller price haha) but otherwise the Topshop pair looks slightly nicer. On a whole they’re both so pretty though, I think they’d make a great statement.